Long distance: 35 x in first 10 Nat./ ZLU/ZNB or Afd. 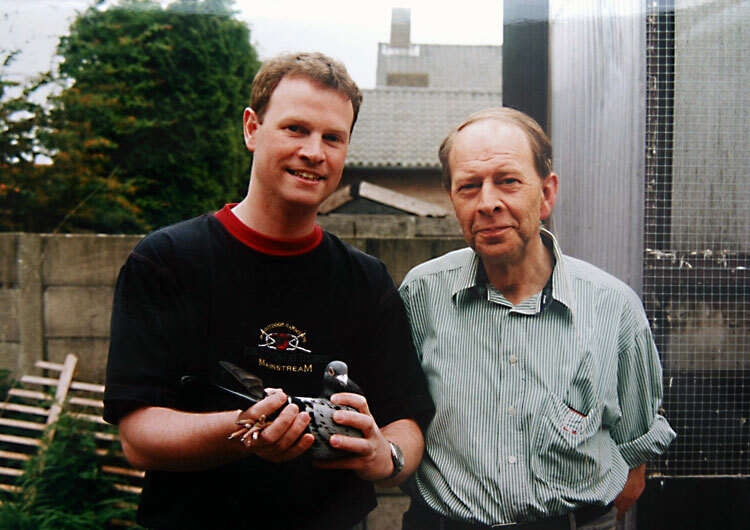 against a average of 10.000 birds: 1, 1, 1, 1, 2, 2, 2, 3, 3, 3, 3, 3, 4, 4, 5, 5, 5, 5, 6, 6, 6, 7, 7, 7, 8, 8, 8, 8, 9, 9, 9, 10, 10,10 (no double) and 236 x first 100. The “stain" has as a basis Jan Aarden and Sjef van Wanroy. With 18 first Nationals and many cracks. Among them: 1st Nat. Barcelona of: vd Wegen, vd Slik, M.Huls, Kuipers bros, Thoné, v. Wanroy. 1st Nat. St.Vincent of: vd Pol-Verhoeven, vd Burgh, Westerhuis, Delbar, R.School. And cracks as: “131”, “Zilvervosje”, “Wonder v.Neer”, “Kleine Jo”, “Gouden Koppel”, “Lamme”, “400” etc. etc. 1st Nat. 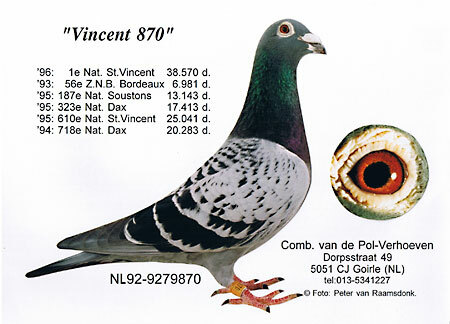 St.Vincent 2000 (v.Boxtel-vd Berg), 1st Nat. Bergerac 1991 (Folkers), 1st & 2nd Nat. Limoges (Verheyen-de Wit), 1st Nat. Orleans (Frank Aarts), 1st Nat. Orleans (L.Stabel & Zn), 1st Nat. Clermont Ferrand (Gijs Peters), 3rd Nat. Dax (Cor de Heyde),1st Midland National Thorness (Jim Shaw), 1st Open MNFC Angouleme 1988 (G.Kirkland) etc..